Тут ви бачите Акумулятор Motobatt — не потребує обслуговування, високий пусковий струм. У нашому інтернет-магазині ви також знайдете тисячі інших високоякісних запчастин за привабливими цінами. This is a high torque battery. The cold cranking amps exceeds that of original equipment. Each Quadflex Battery has 4 terminals (2+ and 2-) and, when necessary, includes spacers for flexibility and fitting. 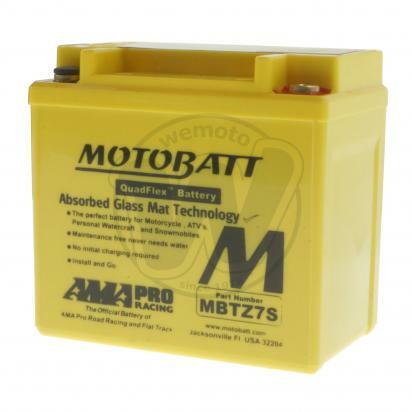 No electrolyte or harsh acids to deal with, MotoBatt Batteries require no maintenance. MotoBatt batteries do not even require charging before being put on the bike, they are ready to install directly out of the box.